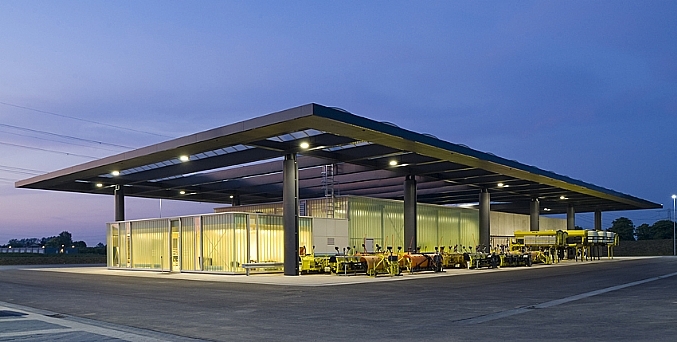 Rijkswaterstaat Salt Storage Centre, Herveld (Management, Consulting & Architects, RGD). Energy efficient construction is now a key issue for every building. The earth is warming up and the demand for fossil fuels is increasing, while our resources are finite. There are however sufficient clean energy resources. Every day 15,000 times as much solar energy falls on the earth as the current total energy consumption. This means that the world's energy needs can be met by enough photovoltaic cells to cover just a quarter of the surface area of France. Herman Schreer, German MEP and the driving force behind the German sustainable economy stated in a lecture during the PROVADA trade fair (16-18 June 2009), that the challenge lies in developing clean energy from infinite sources. And that does not have to cost much more than current sources. "We should invest the money that normally has to be channelled into the production of fossil fuels in the development of techniques for clean energy and energy efficient buildings." The surface area required to supply energy to the entire world if all energy is generated using Concentrated Solar Power (CSP). This vision of energy consumption is a solution for Europe. This continent has limited fossil fuel resources, but does have a high technological capability. The 'Energy' pages on this website support this vision by covering energy-efficient construction and the options for energy-neutral design, construction and use.